When keeping rabbits for commercial use, you must ensure that their accommodations meet American Rabbit Breeders Association standards. Commercial rabbit cages are generally compact and designed for mounting in a variety of ways including hanging, stacking and surface placement. 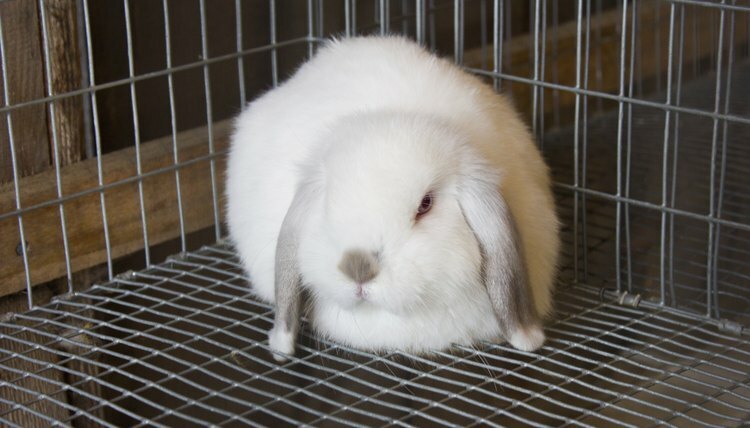 For ease of cleaning and disinfection, most commercial rabbit cages are made of galvanized wire. Wire cages are lightweight and easy to transport, and you can put them together with minimal effort. Cut cage panels out of an 18-inch-wide roll of 1-by-2-inch wire mesh. You'll cut a total of seven panels. Make two 18 inches long and five 36 inches long. All seven panels will be 18 inches wide. Flatten the panels, then connect one 18-inch section to each end of one 36-inch section, using C-rings. Attach one 36-inch section to one of the long sides of the first 36-inch piece. This leaves three sections surrounding three sides of the first section. Fold each of the three surrounding sections upward and attach each one to the adjacent vertical panels, using C-rings. Now you've created a rectangular box without a front or a top. The "top" is ultimately going to become the bottom. Attach one 36-by-18-inch piece of 1/2-by-1-inch galvanized wire mesh four inches below the top edge of the box as it sits. This will be the floor. The 4 inches of space allows room for the litter droppings slide tray. Ensure that you've placed the floor mesh smooth side up, which will be easier on your rabbit's feet. Now attach another 36-by-18-inch panel as the front of the cage, using C-clamps. Attach the remaining section of 18-by-36-inch wire mesh to the top edge of the cage, which will be the bottom of the cage. This panel will hold the litter droppings slide tray. On the front of your cage, which is still upside down at this point, cut out a 4-inch-by-36-inch section for the slide tray. Flip the rabbit cage right side up. Cut two 8-by-8-inch double doors in the front of the cage. Make certain cuts are flush, with no sharp, protruding points. From the remaining roll of wire mesh, cut two doors slightly larger than the front openings. Attach door latches to the wire mesh on the front of the cage, using C-clamps, and attach the doors to the cage with C-clamps. Place or mount the cage where you want it and slide a litter tray into the bottom. Check the entire wire cage for sharp protrusion that may cause injuries to your rabbits.